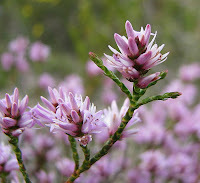 Ericaceae (previously known as Epacridaceae) is a worldwide family of plants that are collectively known as Heaths, and of which Australia is well represented with many varieties. 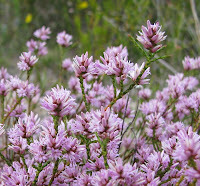 Western Australia has 18 genera and dozens of species, most of which are low shrubs less than 1 metre (3’) in height. Andersonia has over 20 species and belongs to a small group including Cosmelia and Sphenotoma with stem sheathing leaves (the leaves of most genera are not sheathing). From these three genera, Andersonia is the only genus with open flowers (spreading petals) and free stamens (not attached to the tubular corolla). Andersonia parvifolia is a common shrub, locally rarely exceeding ½ metre (1’6”), although it can grow to twice that height. 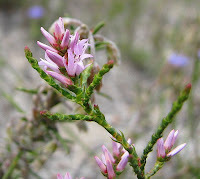 It occurs in non-calcareous sands and gravels in a variety of habitats, but usually part of a heathland community and ranging from Israelite Bay 175 km (110 miles) east of Esperance, to Denmark 420 km (260 miles) west of Esperance and inland to the mallee region. 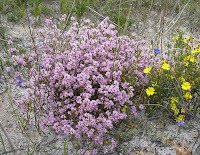 The flowers are prolific and very bright (locally pink to mauve), so not easily overlooked amongst other heathland vegetation, although when not in flower are hardly noticeable. Being a small plant, periodic bushfires are highly beneficial, as they dislike the overcrowding of taller or bushier vegetation. So probably best seen from 1-5 years after a fire, as they can quickly disappear thereafter. The flowering period will vary depending on location and seasonal rainfall, with local plants mostly blooming during August/October, although officially recorded from July to December.